This recipe was in this month's BBC Good Food Magazine as a Treat for 2. I doubled it up to make it a family meal and replaced the cabbage with brussels sprouts which I cooked separately as I hate cabbage and sprouts which are overcooked. It was very nice indeed and I would definitely make it again. Heat the butter in a casserole dish until sizzling, then fry the port for 2-3 minutes on each side until browned. Remove from the pan. 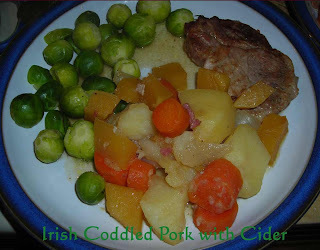 Tip the bacon, carrot, potatoes and swede into the pan, then gently fry until slightly coloured. Stir in the cabbage, sit the chops back on top, add the bay leaf, then pour over the cider and stock. Cover the pan, then leave everything to gently simmer for 20 minutes until the pork is cooked through and the vegetables are tender (I put it in the oven). Serve at the table spooned straight from the dish. sounds and looks yummy Janice! !